Sharing is caring, but it’s not as easy as it sounds. An example of a BYOD-supported collaboration hub by Mersive. Halfway through the second decade of the 21st century, two clear trends have emerged with respect to meetings: First, meeting presenters and participants are relying more on tablets, smartphones, and “phablets” than traditional computing platforms to display slides, photos, and videos. And second, meetings are taking place in unusual spaces, including areas without traditional desks, chairs, whiteboards, and projection screens. Sales of tablets and smartphones, also known as “bring your own device” (BYOD) products, have grown at exponential rates in the past four years while cutting into the sales of traditional notebook and desktop computers. That should be no surprise, as BYODs are actually powerful computing platforms with fast CPUs, gigabytes of flash memory, sophisticated operating systems and touchscreens, and high-resolution display screens. Unlike notebook computers, BYODs can easily travel anywhere with their owners. As a result, many of us use our tablets and phones around the clock and feel lost without them (particularly Millenials!). So it’s logical that we’d want to share the contents of our BYOD display screens with others in meetings, rather than drag along and boot up a laptop. Until recently, the most practical way to show PowerPoints, documents, and photos from a tablet or smartphone has been to employ a Wi-Fi connection and some sort of “bridge” device, a.k.a “collaboration hub,” to display them on a projection screen or a large, self-contained display. All BYODs have Wi-Fi radios built-in and support Transport Control Protocol / Internet Protocol (TCP/ IP). That’s led to the development and sale of several collaboration hubs for the AV market. 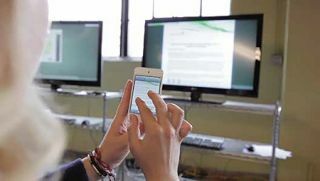 These devices connect to a projector or direct-view display and allow multiple users to log on and share, copy, edit, and annotate presentation material. Indeed, the collaborative AV product space is “hot” right now. These products are designed to operate as “plug and play” interfaces, automatically configuring IP addresses and supporting a wide range of software applications. Corporate, government, non-profit, and higher education markets have shown a strong interest in these products to support a growing number of BYOD platforms (Windows, iOS, and Android). With these collaboration hub products and 802.11n/ ac wireless protocols, sharing and viewing static images is easily accomplished. But that’s not the case when video is played back. Most tablets and smartphones capture video at 1920x1080p resolution with a 30 Hz frame rate, and some new smartphone models can record 4K (3840x2160p) at 30 Hz! So it’s not unreasonable to expect our collaboration hub product to support these frame rates. While TCP/IP is a versatile protocol for send and receiving email and files, it does not provide any error correction or stream management to play video at high frame rates. The result is herky-jerky video through collaboration hub products that frequently locks up or drops out, not unlike what you’d see at home when streaming Internet video to your computer screen. It’s time to go back to the drawing board and design a collaboration hub product that employs various protocols in creative ways, instead of being limited by them. There’s nothing wrong with using Wi-Fi to connect users, but it doesn’t make sense to rely on TCP/IP to handle every type of media we want to use in a presentation. The appeal of BYODs lies in their being true plug-and-play devices. Just power them up and launch an app—that’s all there is to it. There’s no reason why our “ideal” collaboration hub product can’t be just as easy to use, and it certainly shouldn’t require any special add-on dongles that are incompatible with tablets and smartphones. Instead, let’s take the lead from BYODs and switch to a downloadable app to log into and operate our collaboration hub. Thinking further about the design, our hub should be expandable to a large number of users—equal to the largest block of IP addresses it can assign, which would be 256 simultaneous logins. And for end-users that require secure connections, strong encryption (1024-bit) should be a standard feature, along with dynamic room codes. How about image tiling? Any one user can command the display screen. How about two? Three? Four or more users? Given the low cost and size of LCD displays today (and their full HD resolution), there’s no reason why we can’t easily show four, five, and even six simultaneous images on the screen, re-sized and tiled automatically by our collaboration hub. By adding support for a second screen, we can expand that to 12 simultaneous images. The next step is to tackle the trickiest problem of all—streaming video. As we learned earlier, TCP/ IP isn’t a good choice for real-time video playback; not unless we add some sort of real-time transport protocol with adaptive bitrate streaming to support the higher frame rates (30 Hz and 60 Hz) that tablets and phones are capable of when operating in playback mode. Surprisingly, none of the current collaboration hub products can do this. Yet, video streaming problems through collaboration hubs are still the #1 complaint of end users, particularly in the higher education market. But our ideal collaboration hub will support full-motion 1080p/60 video streaming from multiple platforms—Windows, Mac OS, and even Android. Not 15-frame video, not 30-frame video—full 60-frame video, free of dropped frames and frozen images. And it will do this over conventional TCP/IP wired and wireless networks with no special protocols required. While we’re at it, why not include the ability to show the main display screen on our tablet or smartphone? (And all simultaneous images, too.) That function is easy enough to implement, as is an electronic whiteboard overlay for annotation and picture-in-picture (PiP). If our primary display is a touchscreen monitor, then its functions should also be supported by our hub. Let’s finish off the package with native app hosting, multi-user file editing and manipulation in real time, and quick file sharing capabilities. If one user wants to send another a file, they simply send it while a session is in progress. If several members want to mark up or edit a document, they simply edit it. And we can also support remote users who log in via Skype, Lync, WebEx, GoToMeeting, and other conferencing programs. The system we’ve created looks and works a lot differently than any collaboration hub product offered today. But the truth is; none of the technology it relies on is exotic. What’s different about our collaboration hub is that it mixes and matches apps, protocols, image processing, and interactivity to best advantage. It’s just a more intelligent approach. Now, we have a collaboration hub product that is really designed for end users, and not for engineers who appreciate technical complexity. What’s more, we can use this new hub with existing AV switching and distribution equipment to expand its capabilities, such as connecting multiple digital display inputs and outputs, or using wireless HDMI to connect our collaboration hub to displays that are mounted in in so-called “ad hoc” meeting spaces with no walls and high ceilings. Best of all, our collaboration hub is platform-agnostic: Mac Os, Android, or Windows will all work with this system, free of dongles or other hardware plug-ins. Logging in is an intuitive process, as is file sharing, annotation, and exchanging ideas. All of these features and advances add up to define a big leap forward for collaboration systems in the age of “Bring Your Own Devices”. Peter Putnam is a technology consultant with Kramer Electronics USA.